Shinagawa Thermal Ceramics at Unanderra, NSW recently commissioned a new ingredients batching plant using a Flow Force Technologies Model XK-C weight controller together with new Flow Force RT4 batch control processing software. RT4 down-loads the batch recipe to the XK-C Controller which controls the sequencing of the recipe and weighing of each ingredient. The operation of the plant can be monitored either from the PC display or from the XK panel. Local manual control from the XK is available as a back-up in the event of PC failure. The company implemented its own PLC to control the valves etc of the ingredient storage bins. The client is pleased with the system from the point of view of operator time saved, batch weighing accuracy, production convenience, and the traceability of each completed job provided by a continuously updated data base. RS232C RT4 can be customised to suit other types of batching plants or production systems wherever Flow Force weight controllers are used and a PC is available. 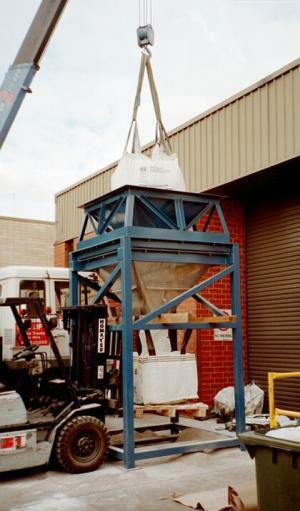 The project also required a BULK BAG DISCHARGER. This was also supplied by Flow Force and has performed very well. The bottom of the bag is automatically split open as the bag is lowered into the discharger and material discharges in a controlled manner. See photo (below) taken during pre-delivery tests at Flow Force site at Ridleyton, near Adelaide, South Australia. A second discharger is now being supplied by Flow Force for another STC batching plant.